The BBC reported yesterday that the US killed almost 60 more people in a series of drone air strikes in the previous 24 hours. The US claims that all those killed were militants. “At least 50 died in three unmanned air strikes in the Tirah Valley, a day after seven others were killed nearby,” says the BBC. 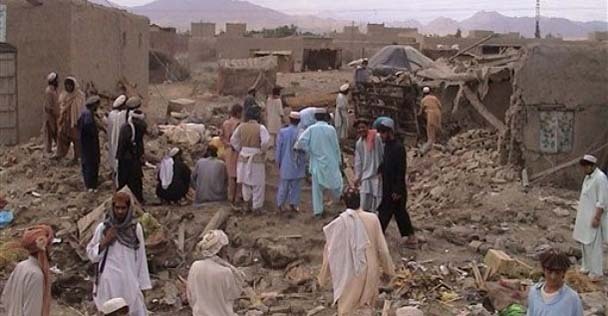 It’s not news that the US has launched another drone attack; Obama’s strategy relies heavily on the unmanned attacks into Pakistan’s tribal area and have been going on weekly, and often more frequently for a long time now. “But the US now appears to be expanding its campaign to other parts of the tribal belt, as most of these attacks have been in the Waziristan region, says the BBC’s Syed Shoaib Hasan in Karachi. When the Bush Administration got serious about its so-called War on Terror, it promised vigorous action, not the “law enforcement” model that Clinton pursued. They created the myth, still repeated today among right wingers, that Clinton’s anti-terrorism efforts amounted to nothing more than lobbing a few missiles at camels. Of course before the attack on the World Trade Center, the Bush Administration did nothing at all. But after that day, they planned to get serious. They mounted a force to take the fight directly into Afghanistan, where Al-Qaeda leadership was located. Initially the US forces in conjunction with existing Afghani anti-government fighters had whirlwind success. They swept the Taliban government from Kabul and had them fleeing eastward into the mountains. When the retreating Al-Qaeda forces were located in December 2001 in a stronghold in mountainous Tora Bora (due west of Khyber province of the federally administered tribal areas of Pakistan), coalition forces, including a US-led special operations force helicoptered in (which would sustain significant friendly fire), attempted to dislodge the Taliban and Al-Qaeda forces from the systems of caves they had fortified. After a fierce fight, the coalition forces had the Taliban on its heels. But for reasons that have yet to be adequately explained (probably owing to inadequate concentration of forces), the enemy forces were able to escape into Pakistan. After this engagement, the Bush Administration seemed to lose interest in the Afghanistan operations and turned its attention to making up a case for invading Iraq. While claiming that Iraq had illegal caches of “weapons of mass destruction,” the administration ordered forces mobilized for the Iraq war it had concluded on starting. The operations in Afghanistan became a sideshow and as for the Al-Qaeda and Taliban forces in Pakistan, the Administration was content with occasionally lobbing missiles and didn’t even particularly care if even camels were hit. So the candidate who would become the 44th President threatened to invade Pakistan without the permission of its President, Pervez Musharraf, a man whom the 43rd President of the United States, while candidate eight years before, couldn’t even identify. That was considered progress of sorts. One of the problems with escalating the Afghan War Obama soon had to consider was that it risked increasing American casualties, which, as everyone learned from how casualties eroded George W. Bush’s popularity, was dangerous to the career of a politician. So the weapon of choice, which was already in use, naturally presented itself: the unmanned drone. This was even better than the manned bomber, because there was no risk of capture. And it had the characteristics that made it the weapon of choice for politicians who look for easy solutions: impersonal killing, reduced risk of casualties, no need for long communication lines that would be needed to support an advanced army position, etc., etc. The problem with bombing, however, is that it is generally considered to be inefficient and usually counter-productive. Nothing solidifies opposition to a force than seeing it rain hell down from the skies. Especially when civilians are killed. And civilians are always killed. It makes no difference that civilians would have been killed by an army on the same mission. The force with the advanced technology, designed to save its own soldiers, always looks the bully (at best) when killing civilians. Mark Clodfelter, a former air force officer, and now a military historian and Professor at the Military Strategy at the National War College in Washington, D.C., having once been the director of military history at the Air Force Academy, is one of the leading current analysts who has written extensively on the inefficiency (and worse) of bombing as a military strategy. His book, The Limits of Air Power: The American Bombing of North Vietnam (NY: 1989), argues that the extensive bombing of North Vietnam had minimal effect in limiting a guerrilla war and in any event could never have established the viability of a South Vietnamese government. This was the very point made at the time by one of our own intelligence agencies. The 1969 study by the State Department’s Bureau of Intelligence and Research (INR) entitled Vietnam 1961-1968 as Interpreted in INR’s Production shows how the military oversells the effectiveness of technology and in the process deludes itself. The document (somewhat redacted by government) is part of the extremely valuable online National Security Archive maintained by George Washington University. The introduction and pdf links to the sections of the 1969 INR report is found here. The United States Intelligence Board, 28 April 1965. See bottom of this post for identification of individuals. The INR was a successor of the WWII intelligence agency the Office of Strategic Services (OSS), which itself did an extensive assessment of the role of strategic bombing in both theaters of that war. After the war, the bureau was transferred to the State Department. Its integrity and careful analysis is often in stark contrast to the many other agencies which executives rely on for actionable intelligence. For example, it dissented from the 2002 National Intelligence Estimate of Iraq, the partisan political document which was cooked by other agencies to justify the invasion. The INR’s 1969 report is a carefully laid out analysis of what worked (very little and in very discreet areas) and what didn’t (most everything) in Vietnam. Aside from seeing the group-delusion among our military professionals that led us to hell in that conflict, it is interesting because the military thinking itself closely resembles the hopeful thinking in this year’s “Afghanistan and Pakistan Annual Review.” In Section VI, for example, “A Massive Effort to Turn the Tide, February 1966-April 1968,” the report explores the last desperate push of the Johnson Administration to pummel the North Vietnamese and build up South Vietnam. 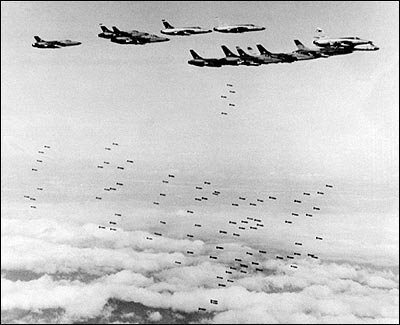 The period followed a unilateral bombing halt that failed to produce any hints that North Vietnam was willing to negotiate. The report then describes the flurry of spending the US embarked upon to initiate a “political, economic and social revolution” in South Vietnam. It was something of a miniature Great Society approach. The US pressured Saigon into pulling off a constitutional reform that gave the veneer of a representative government. And the military embarked on a pacification program as the counter-insurgency alternative to the conventional approach that the Pentagon had up till then pursued. For those of us who lived through the events, the report offers an agonizing insider’s view of what we intuitively could see from outside. The “democratization” of Vietnam, essential for any kind of government supported by the people of the South, never took hold as we envisioned. Although the forms of a Western-style government were put in place, in fact ancient traditions of authoritarianism prevailed. The infrastructure projects, though expensive, failed to convert a peasant society into a kind of economy that incorporated all the citizens. And in the end, while the US became increasingly dependent on bombing, its preconditions for a bombing halt as a prelude to negotiations lessened and lessened until all that was required was a promise to negotiate. But Johnson continued to rely on it, even when the pathologically hawkish Robert McNamara had advised him to halt. 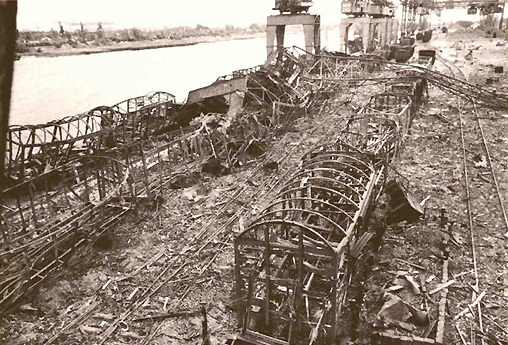 Hamburg, after a week of allied saturation bombing. The resulting firestorms produced heat hot enough to melt metal. All of these actions–and the results–have been repeated (with slight changes for the slightly different context). The drone strikes into Pakistan have become Obama’s weapon of choice as was bombing raids into North Vietnam 40 years before. And there is an ideological reason for this choice. Mark Clodfelter’s new book, Beneficial Bombing: The Progressive Foundations of American Air Power, 1917-1945 (Studies in War, Society, and the Military) (U Nebraska: 2011), shows that the addiction to air power is a “progressive” tradition. And it has nothing to do with its effectiveness (which is much less than claimed). It arose in the aftermath of WWI in an attempt to avoid the horror of trench warfare. “Progressives” argued that air power was the humane way to fight war without the brutal casualties of armed hand-to-hand or close range combat. The belief that air power could largely replace conventional ground war became, and remains, the organizing principle of the US Air Force. The black irony of the approach is that by making the combat “safe” for the perpetrators, it permitted it to become brutally inhuman for the victims, especially civilians. And while it could instill terror into the population and lay waste to infrastructure and industrial capital (as well as deforest vast areas), it is unremarkably unable to instill a desire to support the bombers. Yesterday, at the same time that the reports of the drone attacks came another report, this one from the New York Times: the chief CIA agent in Pakistan had been rapidly evacuated from Islamabad after his cover had compromised and he had been receiving direct death threats over his perceived involvement in drone strikes into Pakistan. For some time now anger has been boiling over in Pakistan over the drone attacks. Much of the population is ready to believe that large numbers of the civilians have been killed by the US. Because the Pakistan government does not acknowledge it supports the attacks (if it does), Pakistanis are able to conclude that the US is acting aggressively. Given that the US has there has conducted at least 100 drone attacks this year alone, the Pakistanis are constantly reminded and new and fresh outrages are produced weekly. All of this comes the very week that Obama’s Afghanistan assessment made clear that unless Pakistan cooperates in ridding militants from the federally controlled tribal area, there cannot be any successful outcome of our Afghanistan adventure. We have been down this road before. Despite what the wise men say, the history of Vietnam is a very clear roadmap to perdition that we are following here. We will see how our President attempts to diffuse this situation. But if history is any guide, this “liberal” president will continue using air power in a vain hope that it can solve everything, while in fact is it firming the resolve of the Pakistanis to resist doing what we desperately need them to. The fact that we seem to have expanded the geographical area we are attacking is just another sign of the widening abyss that we are looking into. 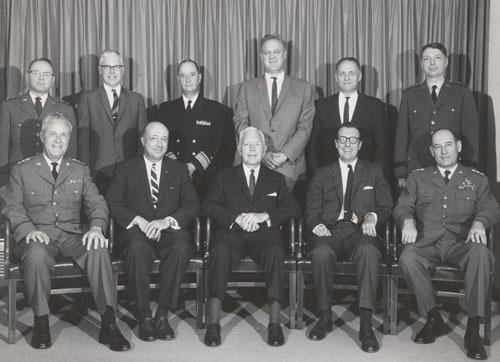 The United States Intelligence Board, 28 April 1965.